Sharon picked up some Brasso at the store the other day and has been on a binge the last couple of days trying to clean up old brass-plated hardware throughout the house. She had been thinking about buying some new curtain hardware, but most of this old hardware is cleaning up satisfactorily. The hardware is definitely not looking "like new," but is achieving a nice, mellow aged look. 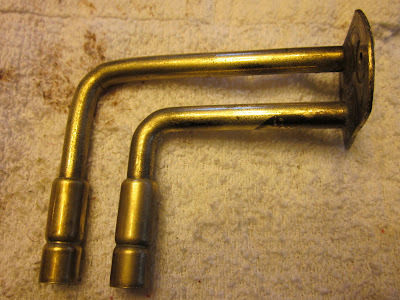 This is one piece of hardware from the living room, shown before and after cleaning with Brasso.